RTW – Eyes on Your Audio: RTW - ... Loudness? Since 2012, a reliable and standardized method for evaluating program loudness is the main element in radio and TV production and broadcast. It became necessary in order to avoid abrupt volume level changes when changing different program types and channels. Broadcasting and multimedia industry took the opportunity to implement continuous loudness analysis in all steps of the production and distribution chain. The current recommendations like ITU (BS.1770 and BS.1771), ATSC (A/85), ARIB, or EBU (R128) provide binding standards for comparing loudness measurements and enabling a global exchange of programs on the basis of unified evaluation criteria. An important part of these recommendations is the consideration that it is essential to adapt the time constant of the loudness measurement to the application. The evaluation of frequency, measuring of individual channels with short integration time period (production), signal summation with average integration time period (production and broadcast) and programm loudness measuring (broadcast and monitoring) are a few of the requirements for loudness monitoring. To cater for this, EBU for Europe has established "momentary" (M), "shortterm" (S) and "integrated" (I) integration times in R128, based on ITU-R BS.1770/1771. These and other parameters are part of the "EBU Mode" to provide comparable loudness measurements. But also other continents took up these loudness values and integrated them into standards with similar specifications. As an example, a live broadcast from a sports event in surround sound will need shortterm analysis of loudness in real time to be able to react fast whereas an integrated measure with long term logging of loudness history is needed for distribution at the broadcasting centre. The RTW instruments will provide efficient loudness measurement tools fully complying to the EBU, ITU, ATSC, ARIB, AGCOM, OP-59, and CALM Act recommendations covering broadcast, production and editorial workflows as well as distribution, quality control, and logging. Also loudness measurements for cinema productions acc. to Leq(), TASA, and SAWA standards can be proceeded. 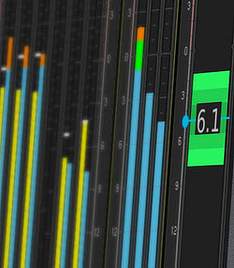 On top of this, nearly all products feature a special ‚Custom‘ mode for users who have to set up their loudness measurement parameters individually, e. g. for non-standardized applications. In addition to numerical and graphical loudness level displays for stereo, multichannel and surround signals, the available instruments also include True Peak and TP Max measurements as well as RTW‘s unique „MagicLRA“ display providing an intuitive readable visualization of the Loudness Range (LRA). Today, broadcasting and practically the entire global multimedia industry faces an historic opportunity - to effectively eliminate the notorious problem of inconsistent loudness being pushed to absolute limits. Mike Kahsnitz, chief technology officer at RTW and a member of the EBU P/Loud project group, describes the current state of international standardisation efforts.For more than 40 years, Cologne-based RTW has been an industry leader in professional audio. Specialising in audio metering and visualisation, the company first became involved in loudness metering 20 years ago. While normal level metering using PPM instruments or VU meters plays an important role in analysing audio with regard to technical standards, RTW realised in the early 90s, however, that this approach was inadequate as the only means of level adjustment from an aesthetic point of view. This is because it does not alloy for visualising individually perceived loudness when listening to audio very well. Therefore, RTW soon started developing . . ."
Q & A with Mike Kahsnitz, technical director of RTW"